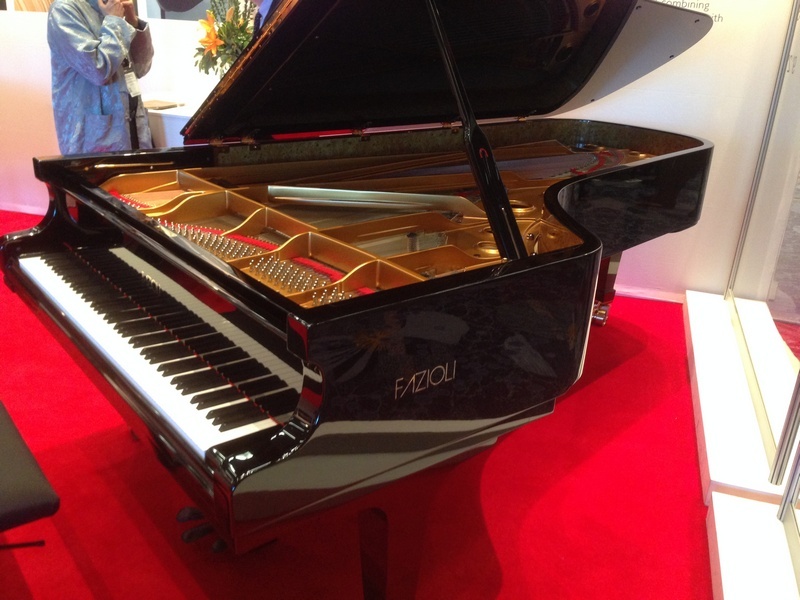 Rick Baldassin is the 2014 Piano Technicians Guild Golden Hammer Award Recipient, and the head of Fazioli USA. 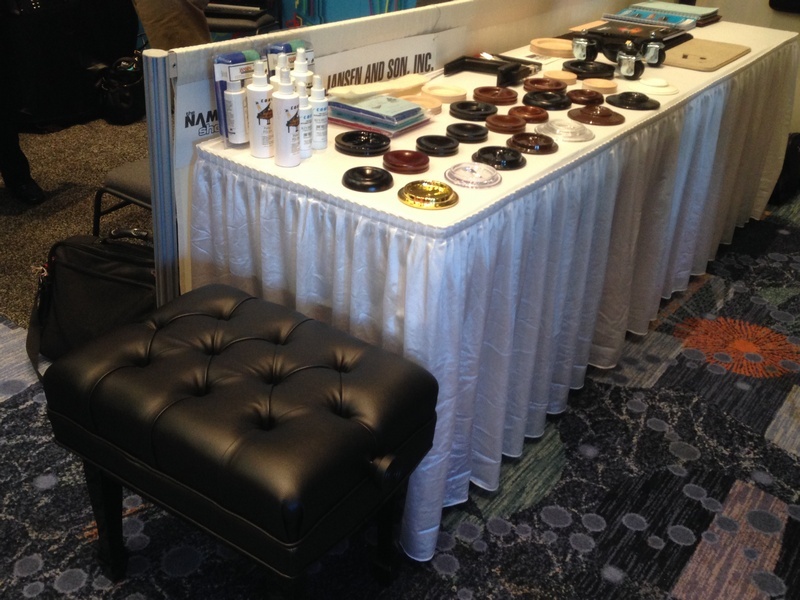 The Jansen Artist Bench is known as the ultimate in American made piano bench quality, shown with other products from P.L. 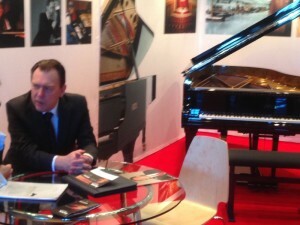 Jansen, one of our favorite suppliers of piano accessories and benches. 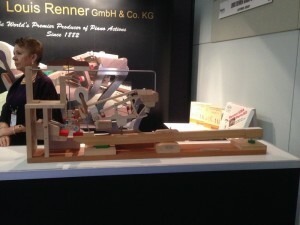 The Renner booth featured a larger-than-life model of a grand piano action. The Piano Technicians Guild had a booth on the 3rd floor – we love you PTG! 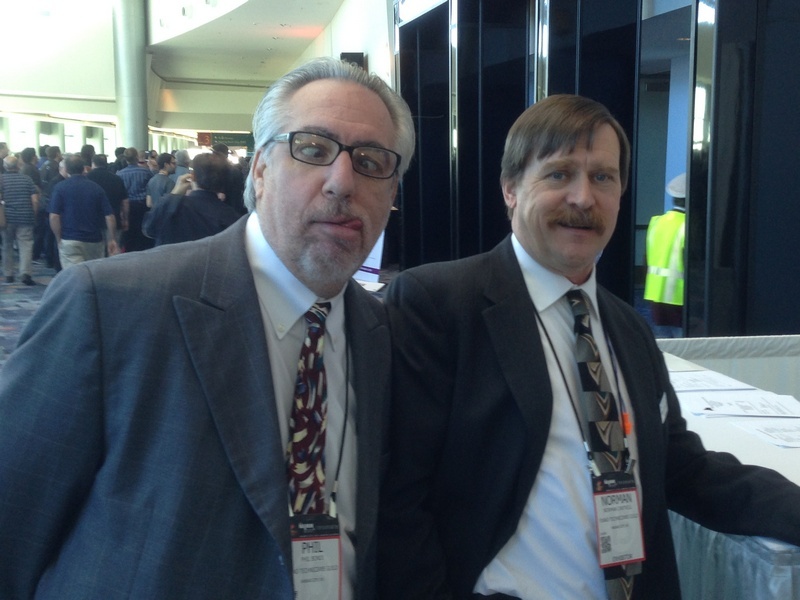 The current vice president (Phil Bondi, RPT) and president (Norman Cantrell, RPT) of the Piano Technicians Guild. 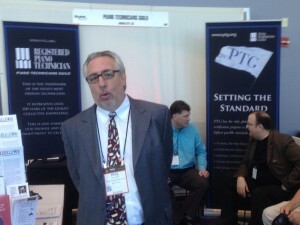 Phil tried to sabotage the photo so it wouldn’t be posted online. Sorry, Phil, you made me want to post it even more. 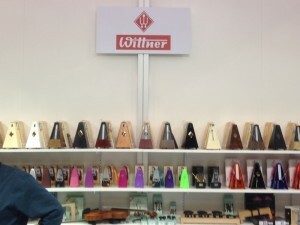 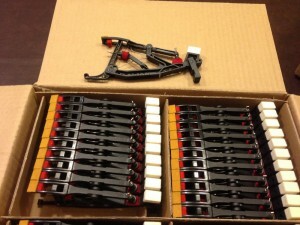 Wittner Metronomes (Germany), another fine product Mesa Piano Service offers to its clients at great prices. It’s hard to imagine how many variations exist until you see them all in one place. 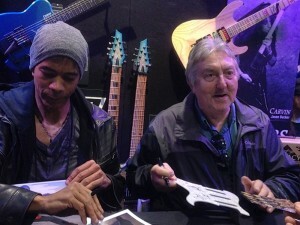 Allan Holdsworth (right) made an appearance at the Carvin booth with Greg Howe (left). 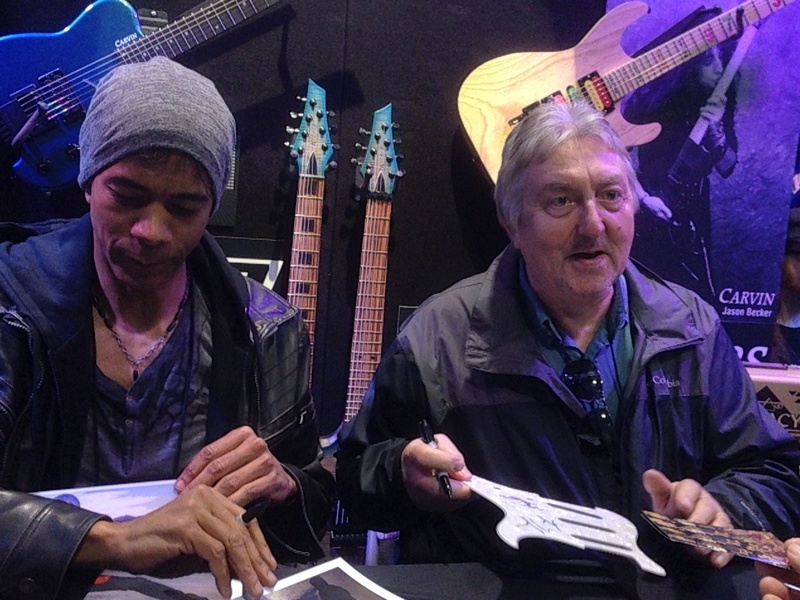 Allan Holdsworth’s impact on the world of guitar playing is monumental, and he is certainly one of my musical influences. 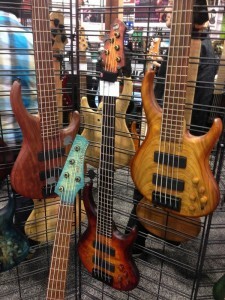 Mayones makes incredible guitars and basses. 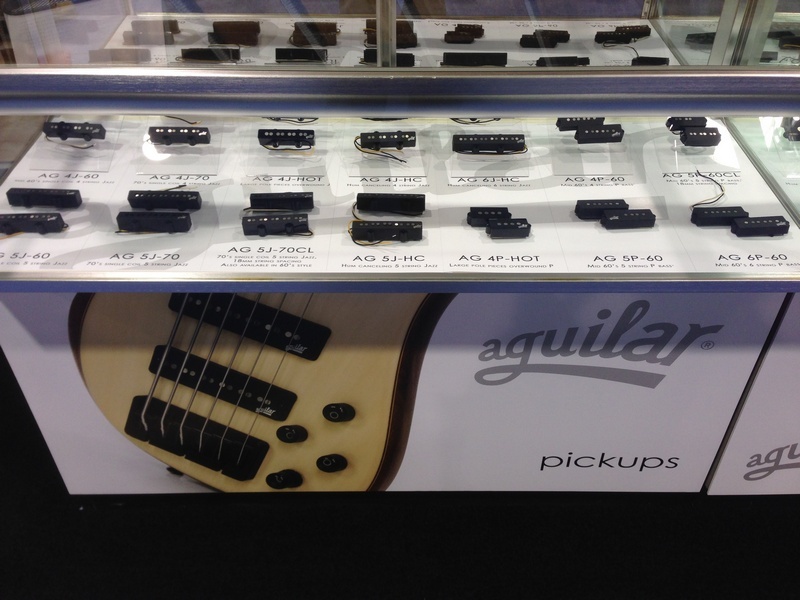 What to install in my 5-string bass… Aguilar? 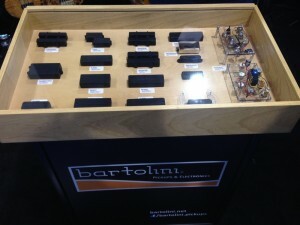 … or Bartolini? That will be a tough decision. 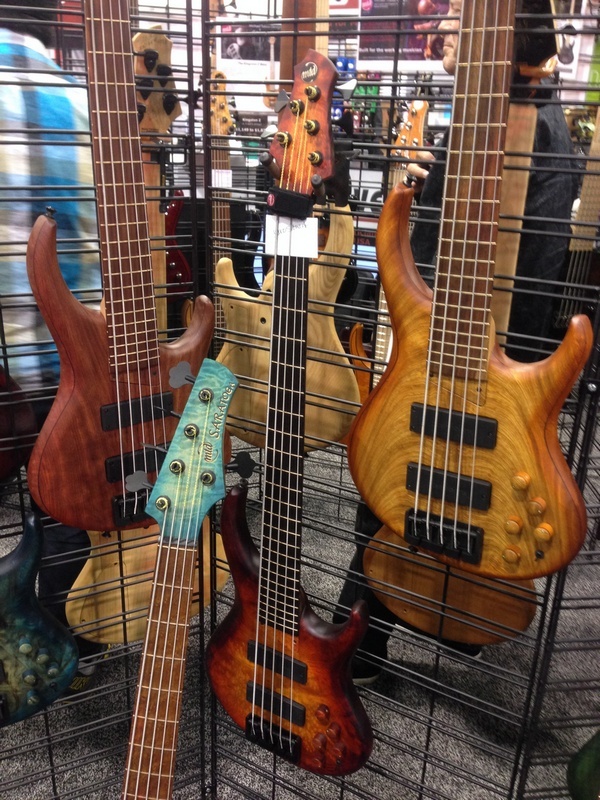 Michael Tobias basses are a sight to behold. 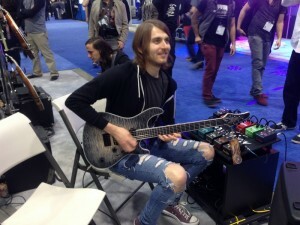 I eventually stopped staring and moved on. 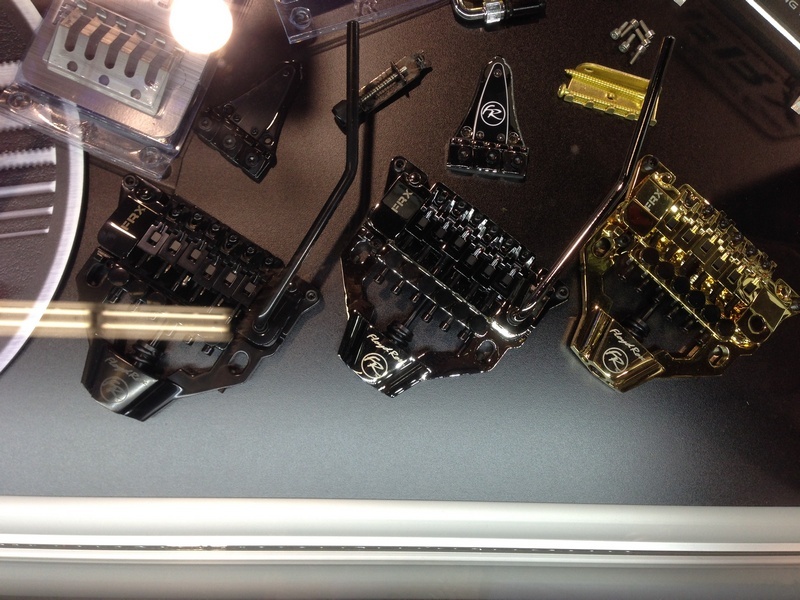 Floyd Rose demonstrated the new FRX Tremolo, which requires no routing of the guitar body. I’ve been searching for a Nylon string acoustic/electric, and after playing this Kala Thinline KA-GTR-SMTN-E, I’m quite certain this will be the one I purchase. 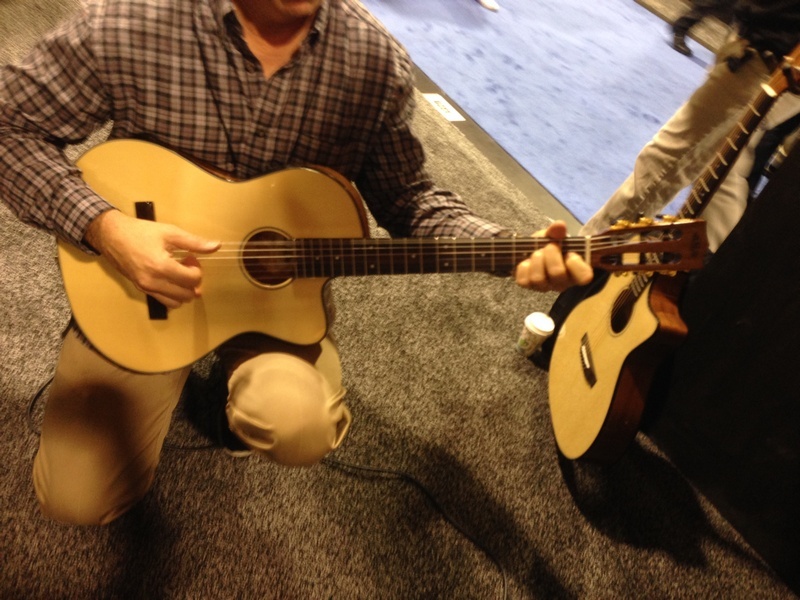 The sound was simply amazing. 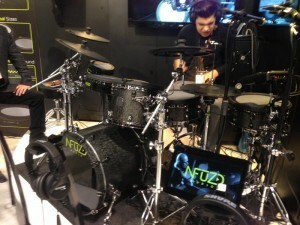 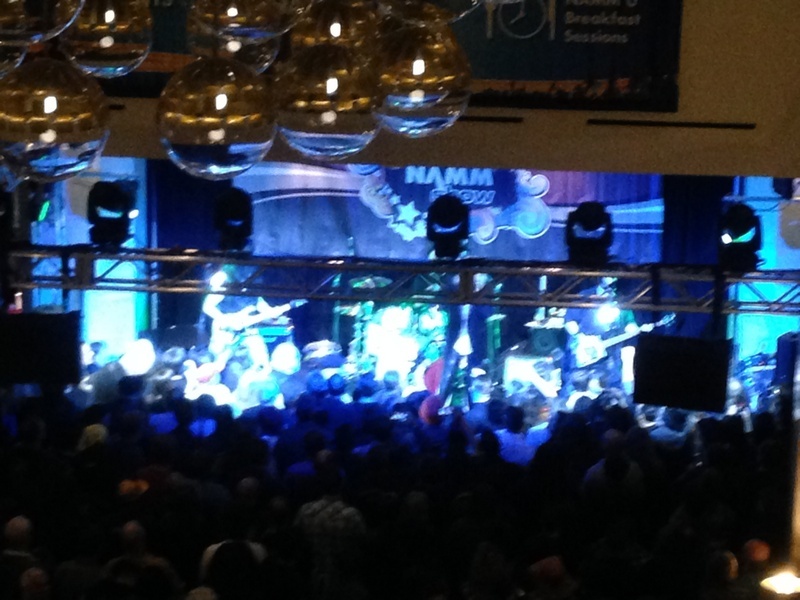 One of the most exciting new products at NAMM (in my opinion) was the new NFUZD Audio electronic drum system. 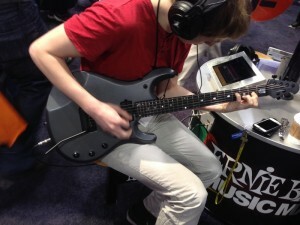 The sound and feel is incredibly realistic. 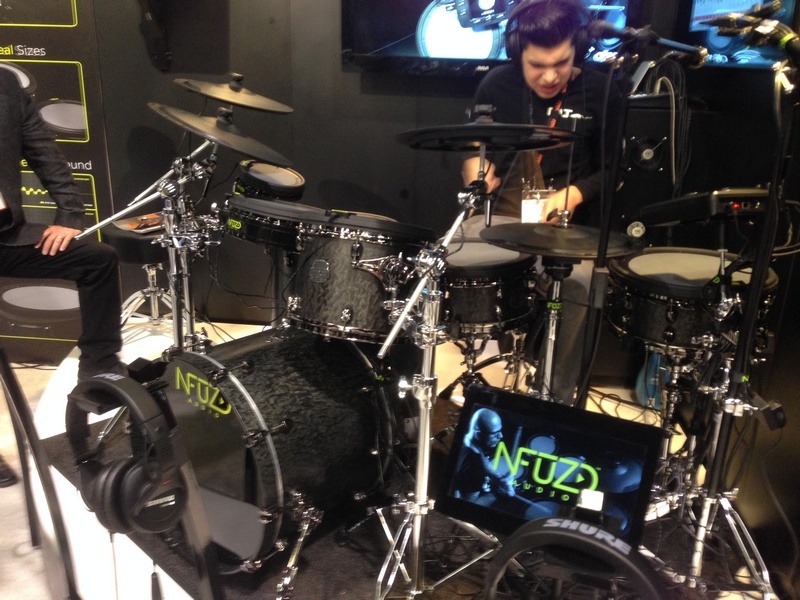 When I asked about the cost, I was prepared to be disappointed, but this drum emulation product is incredibly affordable. 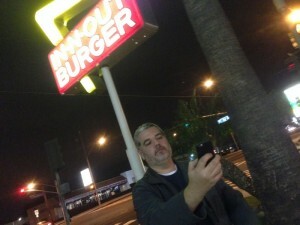 They don’t have In and Out Burger up in Seattle, so this was one of the highlights for Jim. Look how happy he is, taking a selfie with the sign in the background! The Hilton lobby went a bit crazy around midnight as “Hot For Teacher” took the stage, one of the best Van Halen tribute bands. 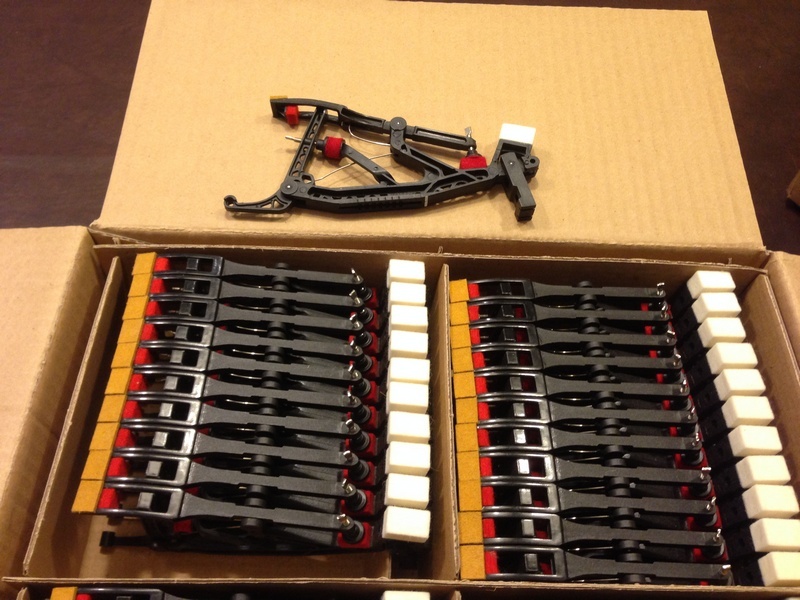 I was sad to leave NAMM, but upon returning home on Saturday, I found something new to be happy about: A new box of WNG repetitions that I will be installing in a 1920’s Mason & Hamlin grand. Back to working on pianos, and looking forward to Winter NAMM 2016.